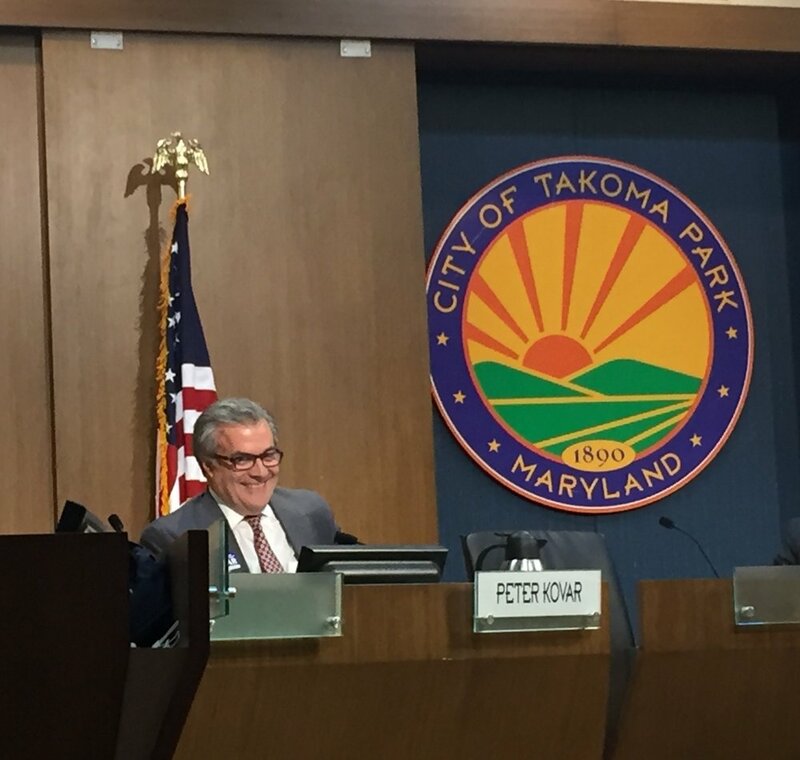 Here’s a link to the agenda for the July 11, 2018 City Council meeting: https://takomaparkmd.gov/meeting_agendas/city-council-meeting-agenda-wednesday-july-11-2018/. We have votes on the Community Quality of Life Grants and the appointment of the Poet Laureate. Then we’ll spend the bulk of the meeting on Takoma Junction, specifically the draft Site Plan resolution, which is scheduled for a vote on July 25. Another Great Independence Day Celebration -- thanks to all who marched or watched or otherwise helped make the July 4th parade and fireworks a success. It was amazing to once again see so many friends and neighbors as my wife Paula and I walked the parade route. Montgomery College Math-Science Building Charrette -- the second charrette meeting is this Thursday, July 12 from 7:00 - 9:30 PM at MC’s Cultural Arts Center (7995 Georgia Avenue in Silver Spring): https://mail.google.com/mail/u/0/?shva=1#search/provost/1646ac24366d0707. The other meetings will be in September and October. At the initial meeting, attendees offered thoughts and comments on issues like size, shape, height and setback of the building. These matters will be discussed again on July 12th. If you can't attend the meeting, you can submit your comments through this link: http://mcblogs.montgomerycollege.edu/tpss-math-science-building/. It's not necessary to stay for the entire meeting to weigh in on the building's design, and I can also pass along written comments from residents during the part of the meeting devoted to that. Ward One Day at Crossroads Farmers Market: This Wednesday, July 11 is Ward One Day at Crossroads Farmers Market, and I invite residents to join me there to enjoy the market's offerings and to have lunch. I’ll be at the market from 11:30 AM to 1:30 PM (you don’t have to stay the whole time). It's located on Anne Street, between University Boulevard and Hammond Avenue in Takoma Park, near the University Blvd.-New Hampshire Avenue intersection. Folks from elsewhere in the City are great about patronizing the Old Town Farmers Market, so I’d love to return the favor with a strong Ward One turnout at Crossroads. I hope to see you there. Pepco Project: While Pepco will continue its project in North Takoma for a number of months, they will also be starting up some work as part of the same project next week in the area around Cedar and Eastern Avenues. I’ll be getting details from Pepco and City staff soon about the schedule, potential detours, etc., and I’ll send around a separate email with the information. Community Quality of Life Grants: https://documents.takomaparkmd.gov/government/city-council/agendas/2018/council-20180711-1.pdf. I’ll be voting for the slate of grants that has been recommended by the Grants Committee. Poet Laureate: https://documents.takomaparkmd.gov/government/city-council/agendas/2018/council-20180711-1.pdf. I’m delighted that Takoma Park continues our tradition of designating a Poet Laureate, and I plan to vote yes on the appointment of Kathleen O’Toole to that position, as recommended by our Arts and Humanities Commission. Takoma Junction: https://documents.takomaparkmd.gov/government/city-council/agendas/2018/council-20180711-3rev.pdf. The draft Site Plan resolution is lengthy and complex, and I anticipate the Council will make a number of changes to it, through an updated draft prior to July 25 and via the amendment process on that date before we take a final vote. Like all my Council colleagues, I had input into the preparation of the resolution. However, on several key points I’m not in agreement with the current draft, especially with regard to overall size/public space and the height of the development structure. I would like to see us modify the resolution to call for more public space and less height. That probably means a building with less total square footage, though there may be other ways of addressing the public space question. I don’t know at this point how I’ll vote on the resolution. That will depend to a large degree on what kind of progress we make in addressing the size and height concerns (at the moment it appears I’m in the minority on the Council on those two issues). There are other areas on which I’d also like to explore potential improvements, including stronger language to help ensure a diverse tenant and patron mix, and, as suggested by Councilmember Dyballa, applying some of the project’s revenue to our affordable housing fund (though that idea may fall outside the resolution itself). I also agree with Councilmember Dyballa that we should seek more specificity in the resolution around environmental issues like energy neutrality, stormwater treatment and green construction methods. The resolution includes language calling for a review by the Council in September to consider the extent to which the Co-op and NDC have reached mutual agreement on the issues discussed in mediation. But I think there should be more clarity on how we would proceed in the event the mediation proves to be unsuccessful, and I’d like to see some tighter language on that point. Finally, I think we should move forward in our efforts to consider possible changes to the traffic flow in the Junction intersection -- taking into account in particular historic preservation concerns, cut-through traffic, and non-automobile transportation -- regardless of what we decide on the Junction project. Just about everyone I’ve spoken to has mentioned the need to address the traffic problems whether we proceed with the development or not. There is some indication that the State Highway Administration has been more able to focus on reconfiguration because the development project has been moving forward. That doesn’t mean we should approve the Site Plan if we don’t like it, but I believe it does mean we don’t have to wait until every aspect of reconfiguration has been figured out before we vote on the Site Plan. Again, the draft resolution is complicated, and in this message I haven’t by any means touched on all the key issues we need to think about prior to the vote. So please feel free to be in touch with comments, questions or concerns about any issues connected to the Junction. I’ve tried to make myself available to residents who want to discuss the project in more detail, and I would welcome requests to meet in person or talk on the phone.